When the Reviews Ed sent this debut CD my way he said it was “Tasty” and he wasn’t wrong. It’s a very British-sounding release with a strong progressive edge to the music and a brooding atmosphere created by the combination of keyboards and the guitar. Paul Mace’s vocals too have a haunting, slightly detached feel, more prog and more Roger Waters than say the more metal James LeBrie. There are a lot of ideas swimming around that owe a debt to traditional metal and 80s melodic rock as evidenced on ‘Rise’ which has a very Dio/early Rainbow air of menace to it. This particular track was produced by Beau Hill (Winger, Alice Cooper) who obviously heard something that he thought was special. Although heavy in places, such as on the best track ‘Before the Dawn’, generally it has a more rock, rather than metal dynamic. It avoids the histrionics of much prog metal as it rocks without sounding, as many in the genre end up, as a pale imitation of Dream Theatre. There’s a real organic feel to the music, which suggests Reason would be a strong live proposition. Some of the melodies, such as ‘Another World’ and ‘Forever’ which has a triumphant almost Magnum-like majesty, would be at home on the records of many melodic rock bands. The record is further enhanced by some glorious guitar playing from Chris Gyngell who mixes solid riffs with long emotive solos, which are often such an integral part of good prog. The solos on ‘Before The Dawn’, ‘Life To A Flame’ and the Eastern tinged title track ‘The Darkest Star’ are worth the price of admission alone. The track ‘Evil Angel’ is a pomp prog anthem and live will be a guaranteed showstopper. Gil Hird’s keyboards add texture, and help expand the band’s sound. Some tracks leave less of an impression such as the closer ‘Cool Starry Night’ which has a haunting melody that feels a little too lightweight. Definitely worth checking out though if you like classic metal, rock and prog. It builds amosphere and slowly draws you in deeper with each listen. Their rock and metal influences combine to offer something fresh. 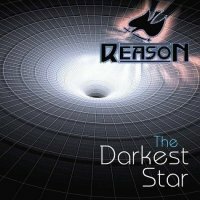 They’re a new voice in British prog and it looks like Reason’s ‘The Darkest Star’ is rising.